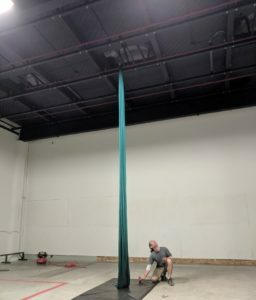 A friend and fellow aerial studio owner (Beverly Sobelman of Versatile Arts) told me she had a dream about our new space Arcadia the other night. She doesn’t remember much about the actual physical characteristics of it, except that it was “dreamy.” Her subconscious was surprisingly aligned with my vision for our new space – aptly named Arcadia, an ancient Greek realm described as an idyllic paradise where nymphs and satyrs frolic and roam freely. Let me rewind a few years to provide some context. Well, maybe more than a few years. At risk of greatly oversimplifying our history, I was present when this magical, theatrical, mythical troupe we call the Cabiri was founded in 1999. I never imagined it would be part of my life for so long, but here I am almost 20 years later. I’ve played a lot of roles on the Cabiri stage – performer, aerial dance instructor, grant writer, bookkeeper, and Managing Director to name a few. Several years ago, it became clear that we had outgrown our existing rehearsal and aerial dance class arrangements – teaching classes via hourly rentals at a cultural arts center and trying to exist as rehearsal space renters in a local circus gym where myth, cultural connection, and storytelling were not particularly appreciated nor welcomed. It became clear that this model was not sustainable, and so the search for a space to call our very own began in the summer of 2016. Our commercial real estate broker had the patience of a saint, showing us property after property from South Park to North Seattle. It was like Goldilocks trying to find the perfect chair – every space we looked at was either too large, too small, too expensive, too raw or too dirty, or too far from public transit. Nothing was just right. We began to grow disheartened with the search, sometimes taking a month or two off from our regular Craigslist searches and commercial real estate listing reviews. But in November 2017, our broker contacted us about a listing in Ballard – about 4,000 square feet, ceilings over 20’ high, available late December at an affordable monthly rental rate per square foot, to be shared with another nonprofit organization. We jumped on the opportunity, our lease proposal was quickly accepted, and we received our keys on the Winter Solstice December 20, 2017. And so the past seven and a half weeks have consisted of very little except the build out and success of Arcadia, our new home for at least the next two years. Our core team of volunteers have spent nearly seven days a week in the space, building, improving, and transforming the former Ballard Brass into a space for creativity, creation, and learning. We have worked hard to clarify our vision for the space, and to articulate how this precious resource can best serve the Cabiri and those in our community whose missions relate to ours. 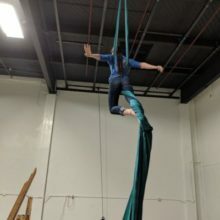 Despite aerial arts being a key component of our work, becoming the fifth aerial dance / circus facility in Seattle is not among our goals or visions for Arcadia. Instead, we envision ourselves a cultural arts center that happens to have a state of the art aerial rigging grid. Our opening date looms just a few weeks into the future, and I know not what awaits us when we open our doors. I hope you will join us on this new adventure in Cabiria.